Fueling the flames again, 2017 Topps Fire Baseball marks the return of the popular brand, this time exclusive to Target locations. 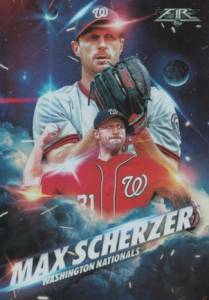 Collectors can find multiple formats including the hobby-like Collector Box that features two hits. In addition to the 20-pack Collector Box, which retails for $70, the Value Box (a.k.a. blaster) goes for $20, and there is also the Fat Packs. All three of these have exclusive options. 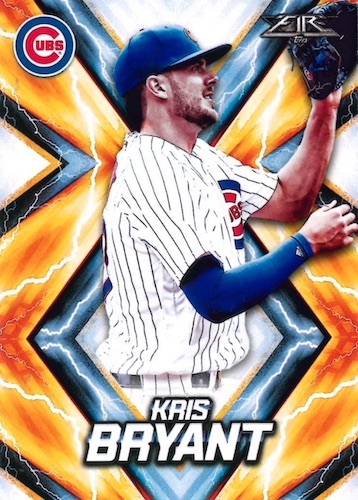 Mixing vets, rookies and former stars, the 2017 Topps Fire Baseball checklist provides a 200-card base set featuring that fiery design we all love. And we can't forget the many vivid parallels, some only found in certain formats. The various options include Flame, Gold Minted (Value only), Blue Chip (Fat Pack only), Onyx (1 per box Collector Box Case), Orange (#/299), Green (#/199), Purple (#/99), Magenta (#/25), and Inferno (1/1). Five chase inserts also display a certain vibrant quality in the retail release. 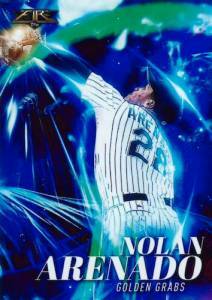 Fired Up highlights each player's in-game reaction, while Flame Throwers is for the pitchers that bring the heat. 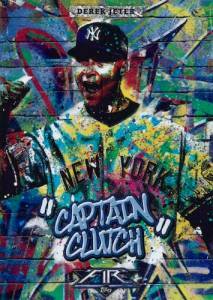 In addition, Golden Grabs zeroes in on those with fielding skills, and Monikers is all about the nicknames set against a graffiti design. Finally, Walk It Off perfectly closes out the choices with memorable walk-off hits. 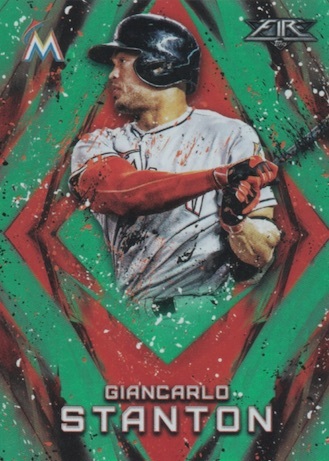 But don't think that 2017 Topps Fire Baseball is only about the design. There be hits, too! Acting as the main signed set, the Fire Autograph insert offers 52 players of past and present. There are also Green (#/75), Purple (#/50), Magenta (#/25), and Inferno (1/1 - Collector only) parallels. 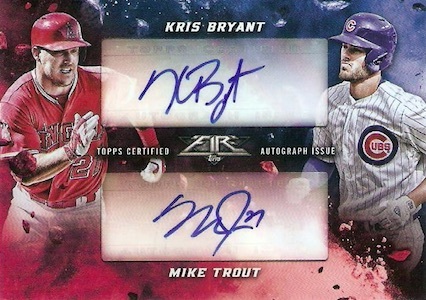 Multi-player options consist of limited Dual Autographs (#/20) and Triple Autographs (#/5). Also providing memorabilia cards, the main Relic set is joined by Fire Autographed Patches, both in a similar horizontal layout. Manny Machado 2017 Topps Fire Magenta SP Auto 17 25 #FA-MM Autograph Target Exc. PARALLEL CARDS: Red Flame, Gold Minted (Value only), Blue Chip (Fat Pack only), Orange #/299, Green #/199, Purple #/99, Magenta #/25, Onyx (1 per box Collector Box Case), Inferno 1/1. 52 cards. Shop on eBay. PARALLEL CARDS: Green #/75, Purple #/50, Magenta #/25, Inferno 1/1 (Collector Box). PARALLEL CARDS: Magenta #/10, Inferno 1/1. PARALLEL CARDS: Green #/75, Purple #/50, Magenta #/25, Inferno 1/1. PARALLEL CARDS: Gold Minted (Value only), Blue Chip (Fat Pack only). Good: Finally a full Fire set; great base design and insert variety; helps that one hit is guaranteed to be an autograph for Collector boxes. Bad: Sticker autographs with pretty huge print runs; retail-only makes it harder for all collectors to find some. The Bottom Line: After years of waiting, Fire finally has a standalone set to call its on. 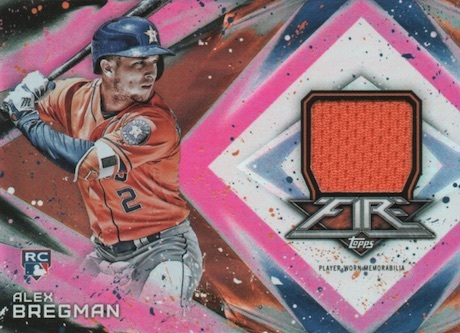 The retail-exclusive aspect does complicate things a tad, but if you enjoy the Fire design, it can be an intriguing MLB option. It’s important to realize that 2017 Topps Fire Baseball is issued through Target locations and is fairly basic as a result. However, it does exhibit a more beefy retail offering of cards, including multiple parallels, inserts and hits. This means more designs, as well. The base set actually features three different primary designs. The most eye-catching is the golden-yellow bordered diamond shape that is filled with lightning. This is my favorite. Another has a larger diamond shape that occupies most of the background along with what looks like paint spots. These only display team colors so they can have a more varied look across the checklist. Lastly, there is an octagon of sorts that has bright sparks. These also heavily utilize the team colors, but the main frame sticks with a light blue/gray color. 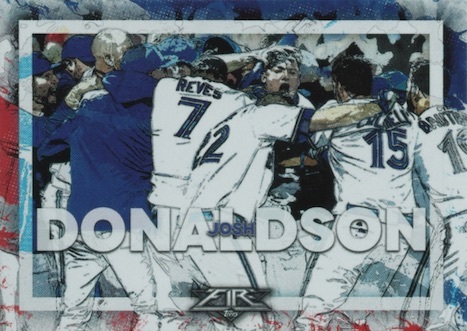 Given the various color schemes, spotting parallels could have been an issue but Topps went with foil, which was the right call. Some of the colors clash but they are fine and pretty easy to identify, especially since most are numbered on the back. Base autographs simply take the main card but go with all foilboard for a nice shine. Inserts are even more elaborate, like the outer space Fired Up set. 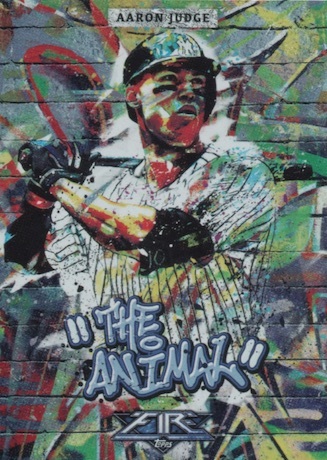 I also enjoyed Monikers with the graffiti-style art. For a retail-only set, the 2017 Topps Fire Baseball checklist is actually pretty deep with 200 base cards and five different inserts. They even have base rookies for both Judge and Bellinger, which hasn’t been the norm. As far as the signatures, the Fire lineup appears strong on paper. However, when you look closer, you realize that many of the rookies and younger players have print runs in the 400-500 range. The bigger names with live autographs have much less than that. That also brings us to the fact that there are quite a few redemptions, including Judge and Bellinger. 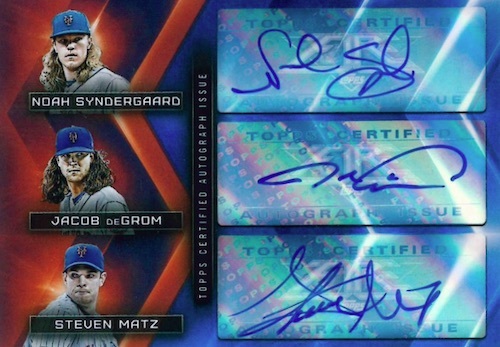 All things considered, I appreciate that Topps numbered all cards so we can get an accurate picture, it’s just important to realize that the signers list is not exactly what it seems. At Target, the 2017 Topps Fire Baseball Collector boxes run $69.99. Given that at least one of the two hits is an autograph, the value is solid at that price. 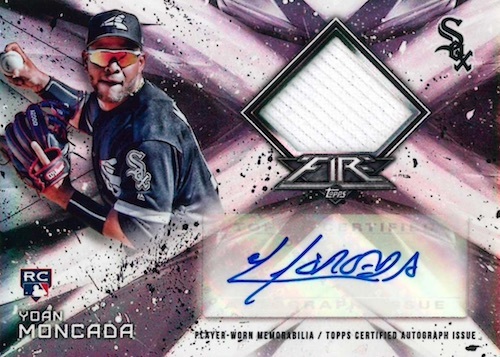 With only the potential for basic hits, however, you either need to pull a top name or you will be left with an auto and a relic worth only a few bucks apiece. As we see time and time again for retail-only sets, the secondary value surges based on the initial demand instead of actual value. Unless the overall production is tiny, patience is likely your best ally as many locations get their shipments later. Value aside, I loved Topps Fire. It is probably one of the most enjoyable low-end sets I have opened in a long time. It's certainly not the greatest set in history, but Fire is something fresh in a sea of throwbacks and recycled designs. The design is new and exciting, the inserts and parallels are in good supply, and the retail price is fair. That's a win in my book. 2017 Topps Fire Noah Syndergaard Jacob Degrom Dual Auto #'D 20 METS CY YOUNG! 2017 TOPPS FIRE TREA TURNER FIRE AUTOGRAPH AUTO PATCH CARD MAGENTA #D 2 10 SSP! What the heck? How come I didn’t hear about this release? This looks a LOT like something that was meant to be a digital card. I think this may be something I’ll need to see in hand to truly appreciate it. With so many variations, it should be fun to line them all up together. Just bought my first 2 packs. Last 2 available at our Target store. Managed to get a Aaron Judge autograph redemption card. Like the looks of the cards. This stuff looks pretty good. Some of the unnumbered parallels are tough to tell the difference between. One thing that I really like is the auto checklist. With a lot of products when I look at the auto checklist and say “How many of these would I be happy with pulling?” Usually it’s 1/4 or less. But with this product the auto checklist is pretty good and its just under 50% of the list I’d be happy with getting. Just like with all of the retail exclusives this year for baseball – good luck finding any of it. lol! The stuff looks really cool. 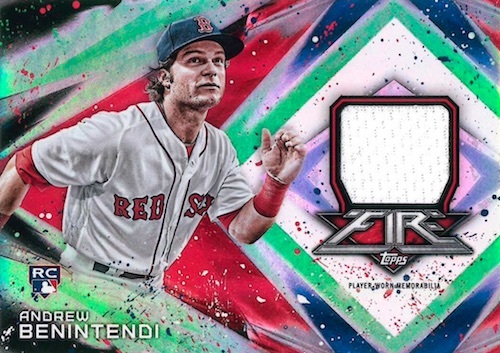 I always liked the Topps Fire insert and I am happy they decided to make it a standalone set. I haven’t went to Target yet to find some, but hopefully I can find a couple of boxes. Dylan: Sticker autographs have no expiration date. This sort of thing happens fairly often, at least until the supply runs out. Managed to get a few packs of these online, they look amazing! So much better than some of the samples I’ve seen going around online. In person these look flawless, so happy Fire made it as a standalone for baseball. Looks like the chase inserts have parallels depending if you pull them from fat packs (blue) and value boxes (gold). This is beyond the base set parallels. These are another Topps retail only scam. I like the idea, and I liked them as the insert set in Update a couple years back. Problem this time is that these are cheap. I would compare this set to the physical BUNT sets of 2016 and 2017. Kinds slippery /shiny cards that are really thin and don’t do much. 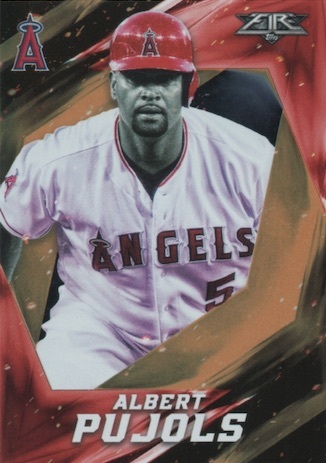 All the parallels are kinda silly…and a few of the Monikers inserts are tough to read with the bright “gold” coloring. Got mine on eBay for about 15% more than retail cost, but not really worth it. Once again, retail only product and blowout cards is already selling them at a mark-up. I have been calling and visiting 8 target stores within a 75 mile radius of my house and they dont have any or they are all ready gone. I am convinced that the boxes are not even making it to the shelf. I think my local stocker is doing deals in the parking lot. This also happened with the bowman mega box. Everybody has piles of the stuff and you have none. Geez, i only wanted one or 2 boxes to open and build the set and i can’t get it. I cant believe these so called hoarder losers buy all this product up just to make a few dollars on ebay. I guess, I will just save my time and energy and pay the 90.00 dollars they are asking online. I mean really, with tax the boxes would cost me 74.19 out the door. How is that this is a target exclusive and my local fred meyer(kroger chain grocery store) had 6 fat packs for sale, but the 3 targets near me had nothing??? This was 2 days ago. How do I differentiate the Flame parallel from the others? Does anyone have side-by-side pics? Scott: Flame has red foil. If you look on the Review tab, the Contreras in the gallery at the end is the Flame parallel. I was lucky enough to find a blaster in 1 of the 5 Targets near me. but find endlessly confusing SN parallel inserts quite annoying. The value to these seems to be the relatively low auto insert ratios. My 7 reg blaster packs contained (1) Moniker Gold Minted – Bill Lee, (1) Flame Thrower Gold Minted -Andrew Miller, (1) Golden Grab Gold Minted – Anthony Rizzo, (1) Orange parallel – Ted Williams # to 299, (2) Flame parallel – Didi Gregarious, Rob Zastryzny, & (1) Base Fire Auto Reynaldo Lopez # to 500. 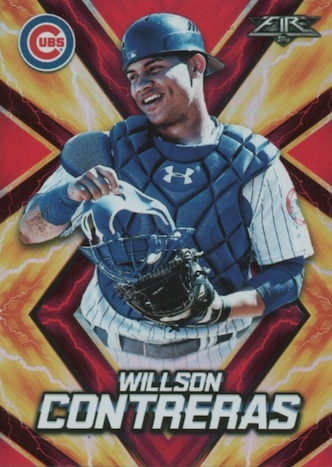 I’m a fan of this Target-exclusive Topps Fire set. I did have to look around for a couple of weeks at like five different stores till I finally found some of the collectors boxes. The base set is certainly different than the other ones I collected this year. Although they are a bit cartoonish, I like the funky designs and that the checklist includes a good mix of rookies, stars, and legends. I would have appreciated much more variance in the collation. I was disappointed that I did not complete the 200 card base set with the 398 base in the four boxes I got. At least I have plenty of traders (including a fair number of triples and quadruples) lol. I like the inserts in terms of concepts, quantity, and wide variety of colors. Speaking of colors, the various foil parallels are really nice. Some of the designs may look very dated in 10 years but for now they’re cool. The hits I got ranged from decent (Ryon Healy RC GU #/110) to awesome (Andrew Benintendi RC auto #/50), and were much better than the hits (if any) you usually get in a retail release. 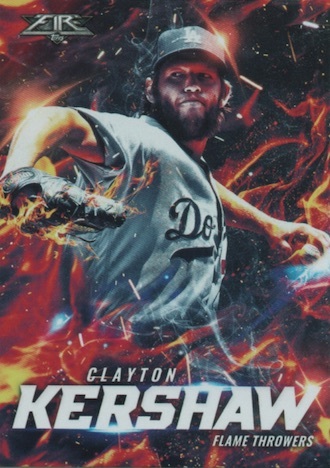 I’d recommend 2017 Topps Fire and give it 3.85 out of 5 stars. 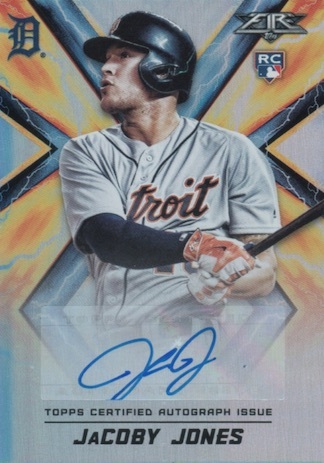 (If you’re interested, there’s a more detailed review with images at https://vbsportscards.wordpress.com/2017/10/08/2017-topps-fire-baseball-hot/). Just picked up a 7pk. box and a 20pk box yesterday. Was deciding weather or not to open them….and I did. One autograph hit in the 7pk, and TWO autographs in the 20pk. box! Bought a blaster box and a “hobby” box for my son, who loves anything Topps Fire (a real shame they don’t have the football license anymore). The blaster was mostly a bust, but the Anthony Rizzo /25 (!) and Michael Fulmer /325 in the hobby box more than made up for it. Great set for the kids. Glad Topps is making the effort to reach them since they’re really the future of the hobby. Overall, I’d say the fire set looks like it’s for kids. 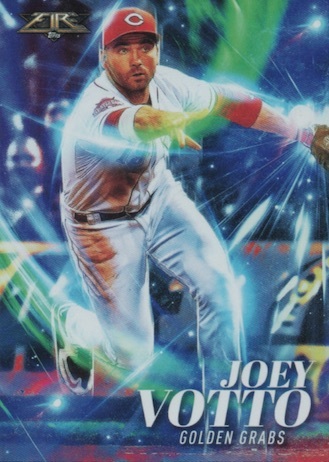 They look more like some kind of superhero card with the only indication that they are baseball cards is the picture of the player itself. Other than that, the cards have no indication of the game of baseball at all. Just a lot of flashy colors that you might see on some kind of superheroes or something like that. I think Topps is really reaching with the fire set. Just my opinion. This is a beautiful set with a lot of brilliant color variation and high levels of rarity. This was a well thought out set and contains an amazing rookie class. I am so impressed. Bought four packs today (fat) at one of my Targets. Got extremely lucky on last pack and pulled Phil Niekro Autograph Magenta /25. However there is a crease on the bottom so this will down grade any grading and worth a bit. But since it’s and old timer I love it. The only thing I do not like of these cards is the fact that due to them being shiny and very glossy, the corners nick and get damaged easily as I found this in another pack. I’d be very upset if I pulled say a Judge/Bellinger Auto and the corner was destroyed. Also the blue/gold Parallels are a bit much as well. Crop of autos are nice though. I recieved my redemtion auto from hunter renfroe this past week and i noticed i have an on card auto and others online or sticker autos. Could anyone help explain why this might be? 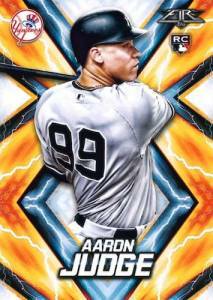 Great product but like other rushed to cash in on Aaron Judge to many redemptions. 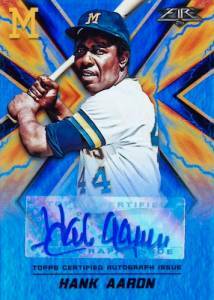 I am still waiting for two redemptions from Topps after almost a year. Maybe when Mike Trout retires i will see my cards? 2017 TOPPS FIRE BASEBALL COLLECTOR SEALED HOBBY BOX JUDGE AUTO ?